On 10.12.2017, the AACTB was honored for honorable merit. 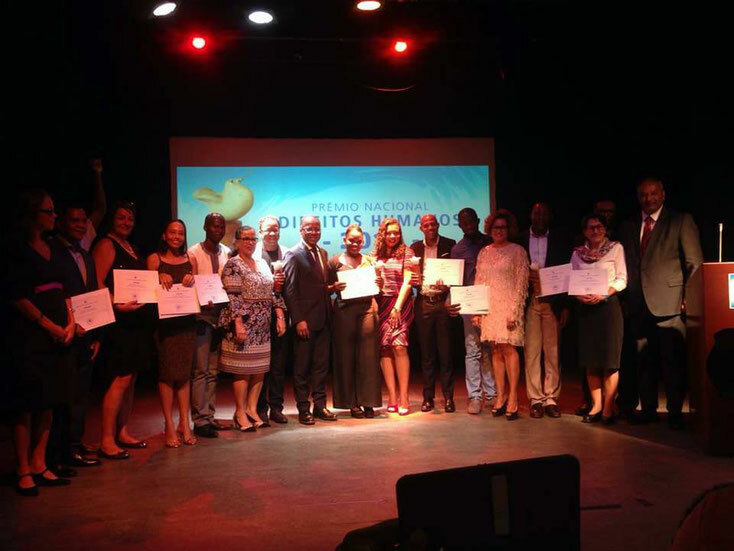 Anne Seiler, President of AACTB, Hnororable Member of the Commission for Human Rights in Cape Verde, CNDHC - Comissão Nacional para os Direitos Humanos ea Cidadania, in cooperation with the United Nations and the Government of Cape Verde presents! 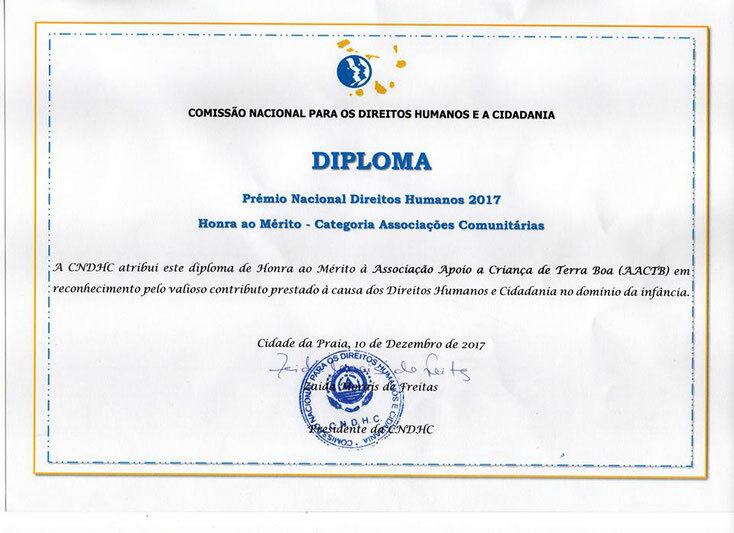 We are very happy and proud of this recognition of our many years of work for the children of Terra Boa and are very happy about the appreciation and tribute. The AACTB sees this award as an incentive and commitment in the fight against poverty and children's rights, educational opportunities, healthy food and clean water. 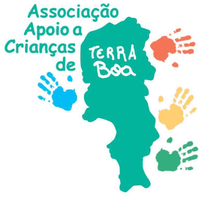 We would like to sincerely thank all the people and staff who accompany and support us on our journey to give the children of Terra Boa a home in the AACTB Child Centre. 03.11.2017 - Ein weiterer Fernsehbericht zu unserer Arbeit im Kinderzentrum - wir brauchen dringend weitere Unterstützung für unsere über 140 Kinder vor allem Spenden, um das Mittagessen und die Gehälter zu finanzieren! 08.02.2017 - Boa, ilha do Sal, um bairro clandestino, que cresce ao ritmo do turismo, mas no lado B do desenvolvimento. Aqui, a associação apoio às crianças de Terra Boa tenta melhorar a vida dos moradores. 01.06.2016 - Internationaler Kindertag. Das kapverdianische Fernsehen TCV begleitete am Vormittag unsere Kinder auf einem Marsch nach Espargos und zurück sowie im AACTB Kinderzentrum. Na ilha do Sal, as actividades ficaram por conta dos moradores dos bairros mais vulneráveis: África 70 e Terra Boa. 20.07.2015 - Unsere Gesundheitsmesse in Terra Boa. Comunidade Terra Boa, no Sal, ajuda a população a prevenir-se de doenças nesta época Quente. 16.09.2014 - Der Präsident der Republik Kapverde Jorge Carlos Fonseca besucht Terra Boa und unseren Kindergarten. Presidente da República visita bairros de Terra Boa e Alto de Santa Cruz, na ilha do Sal. 12.11.2013 - Große Reportage - Slum der Insel Sal. Grande Reportagem - Bairros de Lata da ilha do Sal. 27.05.2012 - Anne Seiler: Hilfe für die Kinder von Terra Boa - Das Original - Kindergarten und Wassertank. Anne Seiler é uma alemã que tem apoiado pessoas no bairro clandestino da Terra Boa. 28.05.2011 - Die Situation in Terra Boa - Ein Streifzug durch Hoffnungslosigkeit und Verzweiflung. Barracas clandestinas já se contam às dezenas, na zona Terra Boa no Sal.